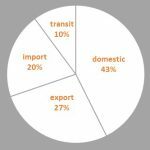 The operators of the Arctic Basin terminals handled 25.6 mln t of cargo (+12.5%, year-on-year) including 16.5 mln t of liquid bulk cargo (+ 16.9%) and 9.1 mln t of dry cargo (+5.2%). Throughput of port of Murmansk amounted 17.3 mln t (+5.8%), Varandei – 2.3 mln t (-21%), Sabetta – 4.1 mln t (up in 2 times), Arkhangelsk – 0.9 mln t (+29.5%). Container turnover in ports of Arctic Basin up on 2.4% to 48.97 thou TEU, from which is the main part it is a cabotage – 48.4 thou TEU (+2.2%), export – 169 TEU (-1.2%), import – 418 TEU (+27.8%). 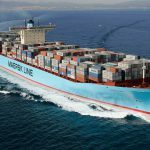 Container turnover in port Arkhangelsk – 10.95 thou TEU (-10.9%). The ports of the Baltic Basin handled 81.7 mln t (-1.3%) including 35 mln t of dry cargo (+10.4%) and 46 mln t of liquid bulk cargo (-8.6%). Throughput on Ports: Big Port St. Petersburg – 19.2 mln t (+15.4%), Ust-Luga – 33 mln t (-0.2%), Primorsk – 18.1 mln t (-18.5%), Kaliningrad – 4.71 mln t (+13). 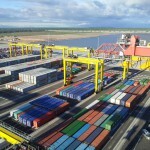 The container turnover in ports of Baltic Basin increased by 11.1% to 803.99 thou TEU, including loading export – 276.3 thou TEU (+15.7%), empty export – 116.3 thou TEU (3.9%), import – 411.4 thou TEU (+10.2%). Container turnover on Ports: Big Port of St. Petersburg – 701.8 thou TEU (+11.7%), port of Ust-Luga – 27.1 thou TEU (+7.5%), Kaliningrad – 75 thou TEU (+7%). The operators of seaports of Azov – Black Sea Basin handled 88.2 mln t (+8.9%) including 39.2 mln t of dry cargo (+19.8%) and 49 mln t of liquid bulk cargo (+1.5%). 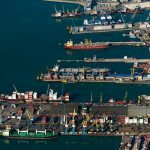 Throughput on Ports: port of Novorossiysk – 52.3 mln t (+8.9%), Tuapse – 8.9 mln t (+0.4%), Kavkaz 0 7.2 mln t (+5.5%), Rostov-on-Don – 5.2 mln t (+34.6%), Azov – 3.39 mln t (+1.5 раза). 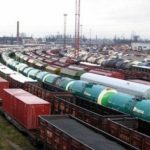 Container turnover in ports of Azov – Black Sea basin amounted 307.13 thou TEU (+22.4%), including export – 148 thou TEU (+18%), import – 154.2 thou TEU (+26.6%), cabotage – 4.3 thou TEU (+10.8%), transit – 245 TEU (+6.5%). 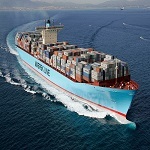 Container turnover on Ports: Novorossiysk – 113.6 thou TEU (+26.4%). The ports of the Caspian Basin handled 1.7 mln t of cargo (+47.4%) including 1 mln t of dry cargo (+16.1%) and 0.7 mln t of liquid bulk cargo (up 2.3 times). Container turnover of the Caspian Basin down on 8.8% to 763 TEU, including export – 307.5 TEU (-12.9%), import –328 TEU (same), cabotage –126 TEU (-18.7%). Throughput in ports of Far East Basin up to 62.8 mln t (-0.4%) including 38.2 mln t of dry cargoes (+1.9%) and 24.6 mln t of liquid bulk cargo (-3.9%). Port Vostochny handled 22.9 mln t (-1.8%), Vanino – 9.7 mln t (-1.2%), Nakhodka – 8 mln t (-2.9%), Vladivostok – 6.3 mln t (+22.3%), Prigorodnoe – 6.2 mln t (+0.9%). The Far East Basin ports container turnover amounted 487.3 thou TEU (+14.7%), including: export – 150.9 thou TEU (+13.7%), import – 149.7 thou TEU (+19.1%), transit – 22.1 thou TEU (+4%), cabotage – 164.3 thou TEU (+10.3%). 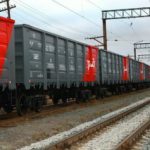 Container turnover on Ports: Vladivostok – 271.4 thou TEU (+16.2%), Nakhodka – 415 TEU (up in 7 times), Kholmsk – 1.69 thou TEU (+47.4%), Zarubino – 116 TEU (-59.6%).